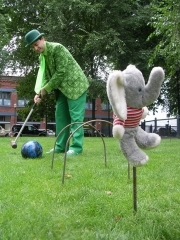 Every year the World Championships of Mondo Croquet are held in Portland Oregon. July 28th 2019 is our next Championship. Yes, we typically break a bowling ball or two. They are actually quite tough. No, the parks service has never complained about us. We’re quite good at cleaning up after ourselves and we don’t cause any actual trouble. Yes, Conch and Maudlin have a bitter rivalry that goes back to the early days. The closest restroom is at the Ben and Jerry’s on NW 10th and Everett. Who doesn’t like ice cream? There’s also a Thai restaurant across the street from the park. Yes, it is our goal to play Mondo Croquet at the summer olympics. The olympics needs more sports you can excel at even if you have grey hair.